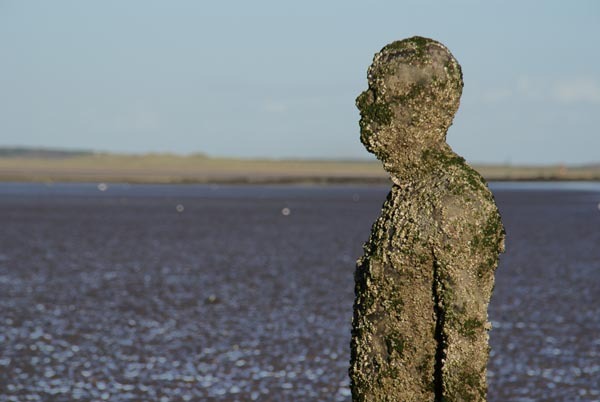 Picture of Antony Gormley's latest public sculpture, Another Place, Crosby Beach, Merseyside. Another Place consists of 100 cast-iron figures, moulded from the artist's own body, weighing 1,433lbs (650kg) and standing 6ft 5in (1.96m) tall. The figures are spread along the coastline and are partly submerged at different times, depending on changing tides and weather conditions. VIEW: More images from the category Another Place, Crosby Beach, Merseyside or taken at the same location or around the same time .